1 of 2 Heat oil in a large stainless skillet over med-high. Combine 1/2 tsp each salt and freshly ground black pepper with Chinese five-spice powder. Rub all over chicken thighs. Place skin side down in pan; cook 12 min. Flip thighs, cover pan and cook until temp reaches 165 degrees , about 10 to 12 min. 2 of 2 Meanwhile, roughly chop baby spinach. Cook quinoa according to pkg directions. Fold spinach into hot quinoa. Stir in cucumber and 1/4 tsp each salt and freshly ground black pepper. Add 3/4 of lemon zest and juice to quinoa. 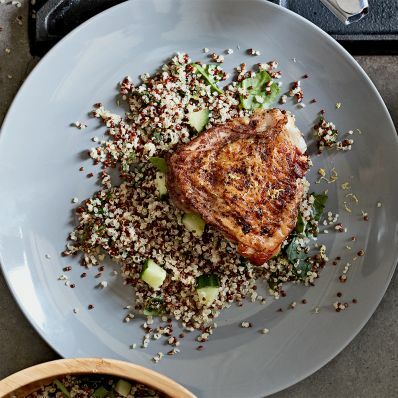 Serve thighs over quinoa and top with remaining juice and zest.